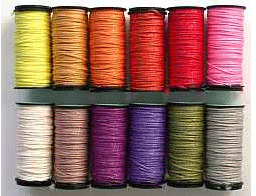 There is a "delicious" selection of new Kreinik thread colors to help stitchers and crafters replicate the glorious shades of nature. Now available in Kreinik Very Fine #4 Braid, Fine #8 Braid, Tapestry #12 Braid, and Medium #16 Braid, the new colors include pumpkin oranges, olive greens, chili reds - all that nature inspires. The almost-matte finish of these metallic colors add "spice" to designs - not too much so as to be overpowering but just enough to add visual "flavor" to your project. Bringing all of your senses alive, you'll also love how soft they feel while you're stitching and creating with your hands. Pictured (right to left) are: 5500 Pink Lemonade, 5505 Red Pepper, 5510 Persimmon, 5515 Clementine, 5520 Ginger, 5525 Lemon, 5530 Rosemary Green, 5535 Oregano, 5540 Boysenberry Blue, 5545 Currant Purple, 5550 Nutmeg, 5555 Oyster. *** May have stock on these limited colors.